Conventional box subwoofers are typically plagued by a "boxy" sound. We have a unique solution to this problem that is not available in other subwoofers. The animation below demonstrates how it works. The animation above shows how definition is lost in conventional subwoofers, and how it is regained with Direct Servo. Click on "view" button to switch from Conventional to Direct Servo. 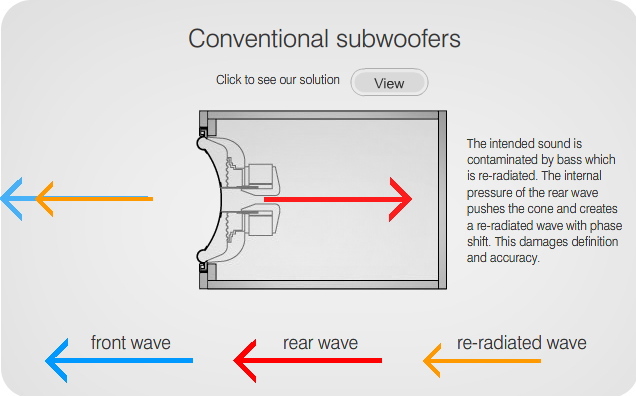 Please keep in mind that the real behaviour of a subwoofer is more complex than we have shown. For the purpose of clear illustration, we have simplified the animation. Please not that re-radiation rather than transmission is shown. The rear sound waves (red) exert pressure on the cone, which results in them being re-radiated by moving the cone. This is different to sound being transmitted through a fixed enclosure. The difference between transmission and re-radiation is discussed below. One cause of this problem is what happens inside the box. A subwoofer driver produces output on both sides of the cone. An ideal subwoofer is one in which the output from the rear of the driver is either eliminated completely inside the box or made to contribute to the front output without any ill effects. In reality, neither is possible, and a compromise is necessary. Sealed subwoofers seek to eliminate the rear wave. The problem in the case of sealed subwoofers is that the rear wave is re-radiated through the cone. Many focus on the impact of this rear wave on causing the box itself to flex and vibrate, but a greater concern is the driver itself which is designed to radiate sound! The rear wave can cause the cone to move and re-radiate with a small phase shift. Anyone building enclosures is familiar with the knocking sound of enclosures with the driver cut-out area open, and how that sound becomes more solid when the cut-out area is covered with another piece of solid MDF. Better yet, one can put the head into the opening and listen the echo inside the enclosure. The term boxy sound has been misunderstood as the sound from a closed box. It is actually more of a box with one wall open so that the reflection/standing waves inside can escape. Therefore a 100% sturdy enclosure cannot get rid of a boxy sound because the internal reflection can still escape. If the cone is not well controlled, the energy can move the cone and produces additional acoustic waves. The result is a loss of definition. It is very common to pay more attention to the issue of tranmission rather than re-radiation, since it is easier to understand and easier to reduce. The transmission of sound through a subwoofer box can be reduced by making it very stiff. Some expensive subwoofers are made extremely stiff with an over-designed box in an attempt to extract a tiny improvement in performance for a significant cost. This is not a very well-designed solution, but with a conventional subwoofer, one has to work with limited methods of improvement. Imagine attempting to warm up your house in winter. You have a heater and an adequate amount of insulation, but the large windows have no blinds, so a large amount of the heat escapes through them. If you wanted to lower your energy cost and warm up the house more, would it make sense to add massive amounts of insulation? It would be a waste of money before first considering the windows, and looking at appropriate blinds. What conventional subwoofers do is more like using massive insulation, but ignoring the massive heat loss through the windows. It makes more sense to first consider how one can reduce the re-radiation through the cone. Transmission occurs when sound vibrates the walls of the enclosure. Re-radiation occurs when the sound pressure waves inside a box cause the cone to move. This should receive more attention than transmission because it will damage the accuracy more. The reason for this is that the cone needs to be far more compliant than the enclosure. The challenge is for the cone to respond accurately to the input signal but reject interference from sound waves inside the box. Vented subwoofers suffer more from this problem, as the vent also provides another path way for unintended output to leak out through the vent. Open baffle dipoles do not suffer from the problem because there is no actual box. Infinite baffle subwoofers have the potential to come closer to the ideal, and this is part of their sound quality. Our GR custom install subwoofers cater to those who prefer either of these options. Many subwoofers simply ignore the problem because there is little they can do to minimize the problem, and what they can do is not very practical. The conventional solution is to provide a stronger motor to the driver. This gives the driver more control of the cone and a lower Q value. The problem is that this involves a dramatic loss of efficiency and output in order to make a significant improvment. With our Direct Servo technology, we are able to provide a Q value of 0.28. A conventional subwoofer would have to increase the magnet size by a factor of 3 to achieve the same level of cone control. This would then yield 5 dB less output around fs. A second subwoofer would be required to achieve the previous output level. 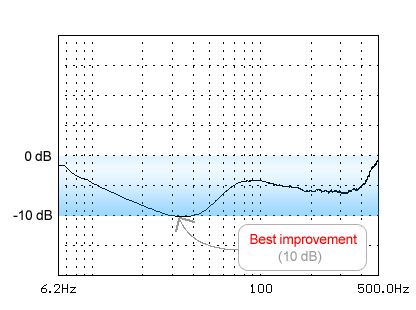 The shaded area shows a 10 dB range. At the top there is no improvement (mid frequencies). At the bottom, maximum improvement is achieved in the mid bass region. This is only one aspect of performance in which Direct Servo is superior. It also reduces distortion and memory effects, ensuring accurate bass with high definition.